Did you know Buffalo Mozzarella Cheese is made from Italian Water Buffalo? Hi There! SO, what the heck is buffalo mozzarella cheese – or Mozzarella Di Bufala as the Italians would say? Where does it come from? Why is it so special? Why oh why does it taste so good, especially in Italy?! Those are questions I had after moving to Italy and learning how freaking delicious buffalo mozzarella cheese is! I set out to investigate… and like always, when investigating, I drag my family along to learn something new with me. 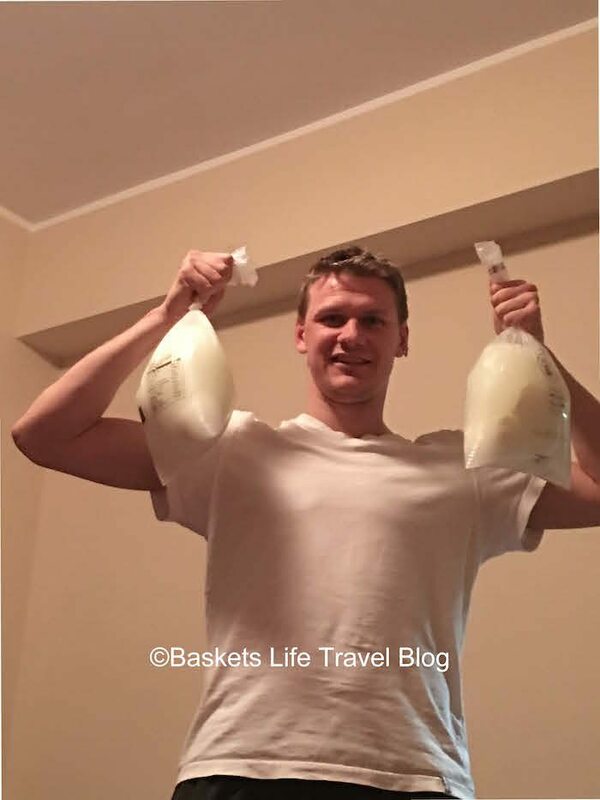 Being the adventurous person that I am, I didn’t want to go to some non-authentic place where they show you bags of mozzarella. I wanted information from the experts; I wanted to go where the locals bought their mozzarella! I decided the Vannulo family, who have been in the Mozzarella Di Bufala business since 1988, was a good choice. They are known as the MVP’s of buffalo mozzarella cheese. They are also one of the only 100% organic mozzarella di bufala farms in the world. The in-the-know locals, and restaurant owners drive as much as an hour, from the gorgeous Amalfi Coast towns, to get this buffalo mozzarella cheese. You even have to call in the morning to reserve cheese if you want some. It’s that good! I called them up and asked if we could come to the farm and take a look around. They were so gracious and invited us to come on by. So, I packed everyone up in the car and off we went! Don’t they look thrilled? The first thing I really needed to know, being a Colorado girl surrounded by lots of buffalo, was why we didn’t make any of this cheese in Colorado? Why do I need to go to Italy for this quality cheese? 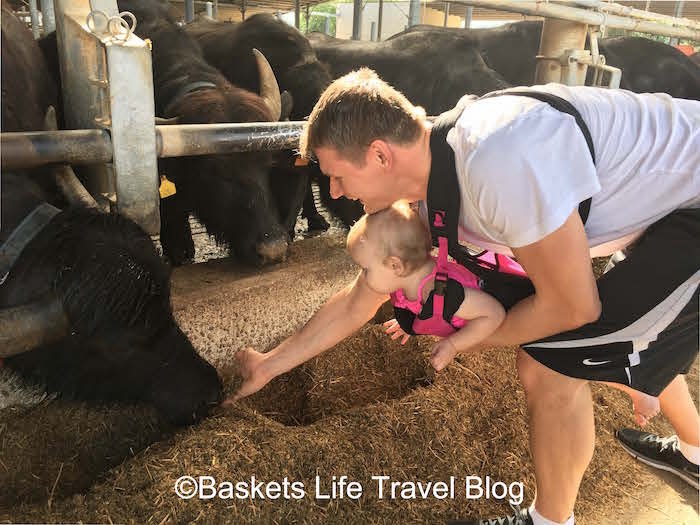 How did our big, American bison get to southern Italy? Well, the first thing I learned was that buffalo mozzarella cheese was made from water buffalo, not bison. Yikes, am I feeling silly right now. Italian water buffalo at that. The origin of the Italian water buffalo is not 100% clear. Some think they came over from Sicily around year 1000 and were more than likely brought by the Arabs. There are many thoughts on this, and most likely we will never know. What we do know is that they make some killer cheese! Next, I learned authentic Mozzarella Di Bufala is only produced in Italy. To be deemed authentic, it has to be made in the regions of Campania, Lazio, Apulia, or Molise. The buffalo mozzarella cheese from Campana, where we lived, has been deemed DOP and is protected under the EU’s Protected Designation of Origin. This DOP stamp lets people know that it is authentic. It can only receive this stamp of approval when it is made from the traditional recipe in those specific areas; so that is why you don’t see mozzarella di bufala production popping up around the world. Yes, other people can make it, but it won’t be authentic. Legally, the world traditional can only go on products granted this designation. So, when purchasing, always look for the DOP stamp. 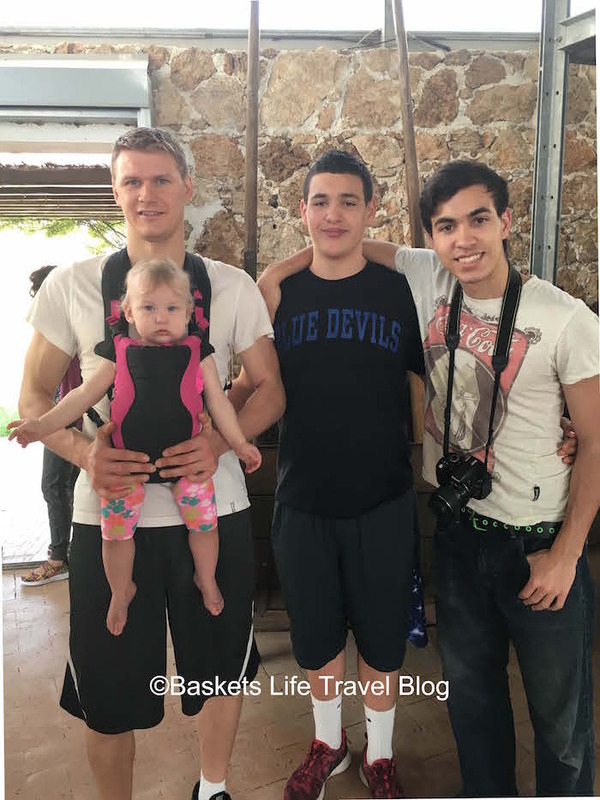 We arrived at the farm and were immediately met and guided toward the stables. I’m not going to say I wanna die and come back as a water buffalo, but these buffalo live the life! They have a massage station, a bathing station, and their own cute beds. They are never milked until they feel ready. They actually walk to the milking machine, and the milk machine milks them without a human being. Oh, it’s a cool process! Then, the buffalo can leave the milk machine, have some food, take a nap, or get a massage. The Vannulo family believes that happy buffalo make better and tastier milk. Obviously, they are doing something right because people drive for hours just to buy their cheese. 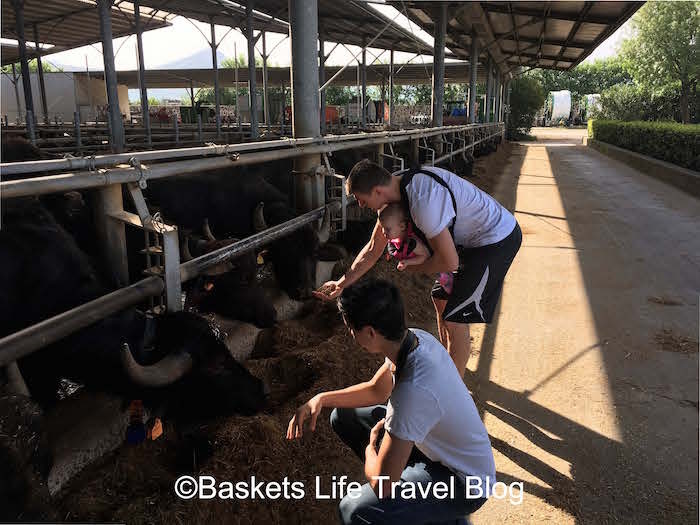 We also learned about the Italian water buffalo, and we were even able to pet them! They were surprisingly calm and ate right from our hands. Awww, I think I want one! During our tour, we got to see how the cheese is made. The process is done on site and by master cheese Gods who have been trained in the special and sacred making of buffalo mozzarella cheese. The word “mozzarella” comes from the word mozzare, meaning to cut by hand. So, every morning, they make fresh mozzarella, and we watched them do it right in front of our very own eyes. 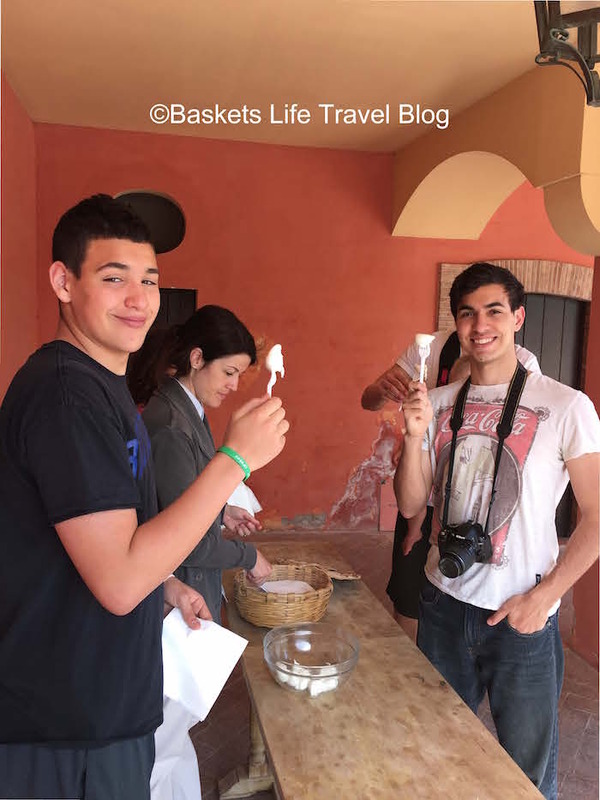 We also learned that there is mozzarella cheese made with cow’s milk called fior di latte, but if you have had the real deal you can taste the difference immediately. You know what they say… “Once you go buffalo…” Well, no. They don’t really say that, but you get my point. Now for the good part – a private tasting of the Italian white gold! 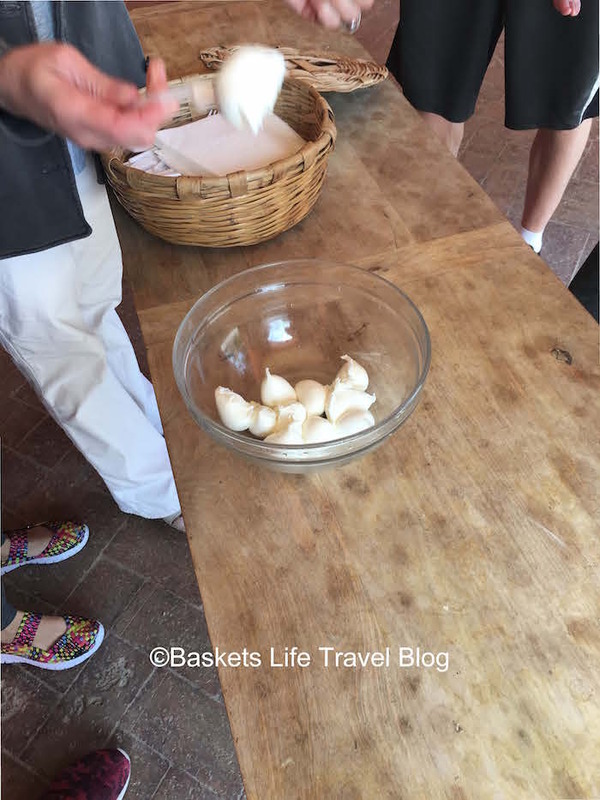 We got to eat some fresh mozzarella di bufala right from the kitchen. Oh, Mamma Mia! The cheese is formed into beautiful little balls, is so creamy, and melts right in your mouth. All you heard us saying as we stuffed as much mozzarella into our mouths was, “Ohhhh”, “Ahhh”, and “WOW.” It was close to a religious experience. If you’re going to taste buffalo mozzarella for the first time, it should be in Italy at a farm. Trust me on this! There is a cute, little museum and leather shop on site that shows the history of the farm and sells handmade, buffalo leather goods. 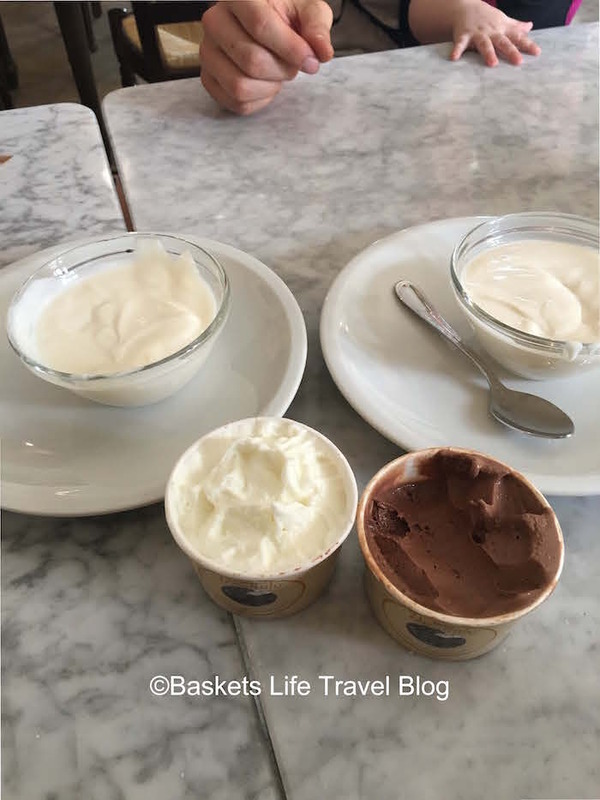 Then there is the store – there are two sections: one that serves fresh yogurt and ice cream; and baby, if you never had buffalo vanilla yogurt, you are missing out! We ate all we could and then were flooded with about 50 people who had hopped off a tour bus; so, we bolted to the next building to buy the fresh buffalo mozzarella cheese to take home. We were asked if we had reserved any cheese for purchase. Ummm, no? We need a reservation to buy cheese? Really? Then, locals started pulling up and picking up their cheese. We had to buy some! Luckily for us, they had reserved us some cheese, unbeknownst to my family. Sometimes, we are some lucky ducks! We happily took home four bags of fresh Mozzarella Di Bufala Cheese . They know how far people drive, so they even package the cheese in a cooler for you to travel home with. I would tell you to look for it in your local store, but the Vannulo family does not sell their cheese in mass production nor do they export their foodgasmic cheese; they only produce for locals and the people of Italy. You can purchase the real deal all over the world but from different farms, we found some Italian Mozzarella Di Bufala from a gourmet grocery shop online. <–Click the blue link to find some authentic buffalo mozzarella cheese. 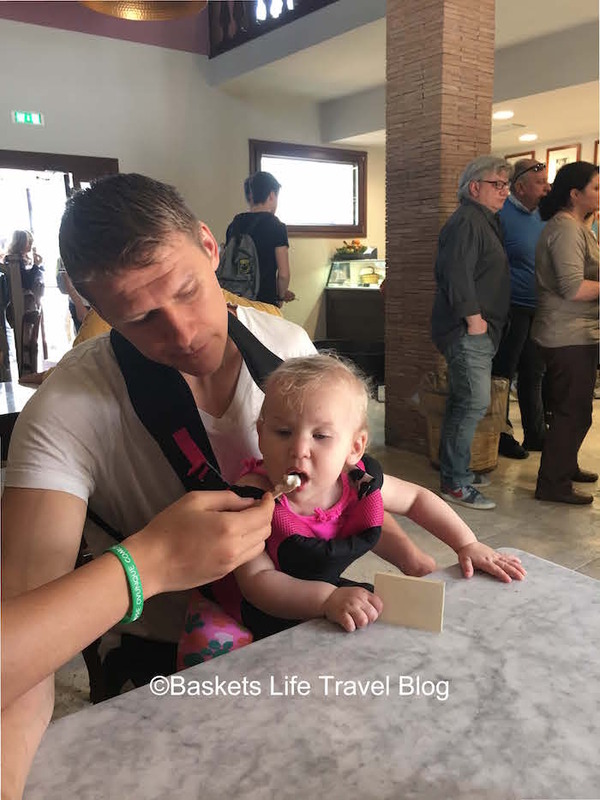 Now that you are hungry, check out our How to Dine out in Italy Guide Here! 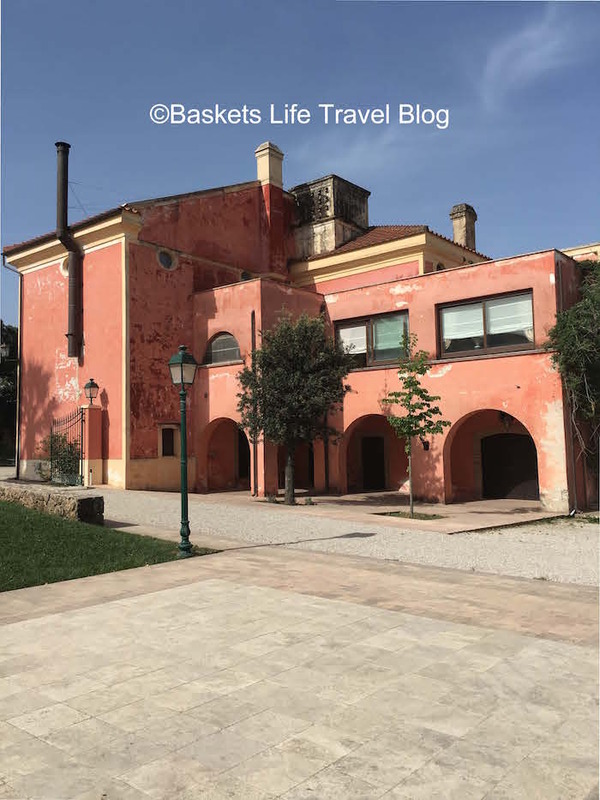 We took this tour, and paired it with a half day in Paestum, Italy. Paestum is where the last and largest ancient greek ruins, left in the world outside of Greece. This tour is a private VIP tour of the organic Vannulo farm and a guided tour of the ancient sites. It was an amazing day! You can check out our tour here. There is also a much less expensive food tour, that can be taken to just do tasting, they have 3 different menu prices, and types of tasting. I cannot guarantee you get to see the Vannulo Farm, as I have not done this tour personally – however it is much better priced. Please compare prices for this tour here. You can also see all things to do in the area compare prices here. Can I help you with anything else in Italy ? The nearest airport is Naples International Airport. Compare flight prices here. Campania is the region, and you could stay in Naples, the Almafi Coast area, Or Salerno. 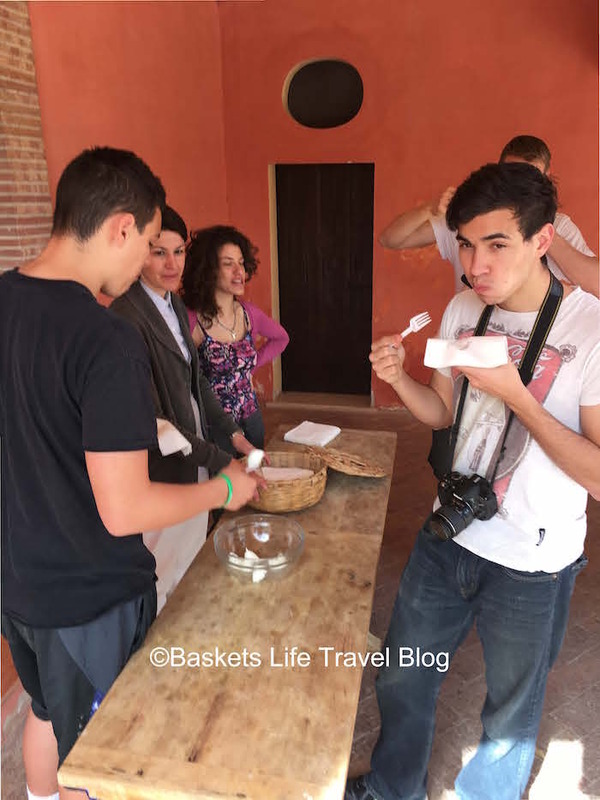 You could rent a car and drive to Paestum and the Vannulo mozzarella farm yourself. Compare Price of Cars Here. Want to learn some Italian? Check out . Pimsleur Italian click below for a free Italian Lesson. Worry less about the unexpected. Get a Free 10-Day Look with Allianz Travel Insurance, the world leader in travel insurance. Make sure you’re covered! this sounds amazing!!! I absolutely love fresh mozzarella! I would die if I got four bags of fresh cheese!! Haha!! 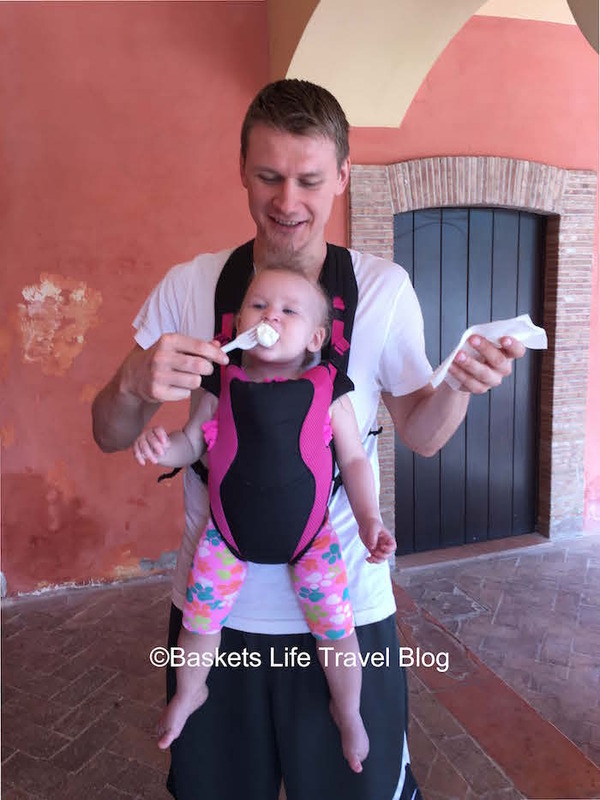 Sounds like such a fun day out and thanks for sharing on FlyAwayFriday!! Whaaaat! That looks like SO MUCH FUN! I had no idea that even existed! Mozzarella is my favorite cheese too, yum - I bet that was seriously so fresh! Thanks for joining Fly Away Friday, hope to see you again this week! Reading about your odyssey with Buffalo Mozzarella had me saying 'cheese', many times over. The cheese looks divine and i can see all of you had a great time. I think getting fresh produce straight from the farm or dairy is an experience which is worthwhile, in the fast paced world of convenience good, these kind of experiences are becoming rarer and rarer. Wow, thanks for the tip! I had never heard of buffalo mozzarella, but Italians know their food, so I'm always up for a new delicacy!! Amazing that locals drive hours to get this specific cheese - we're heading through regional Italy later in the year, so I'll definitely add a visit to the farm onto our itinerary! They even have a massage station! What a great learning experience along with tasty food at the end! Thanks for sharing. I've also been to a buffalo farm in Campania and there's nothing like having a freshly made one. It's one of the most delicious things and I love it just drizzled with a bit of olive oil, balsamic and served with tomatoes. Yum! Well the family sure looks happy at the end of the tour when the cheese gets tasted! I didn't know the buffalo had it so good - massages and everything! That must be why it's so good. We need our water buffalo to be happy so we can have happy cheese. OMG! Buffalo mozzarella and that too fresh! How lucky you are! 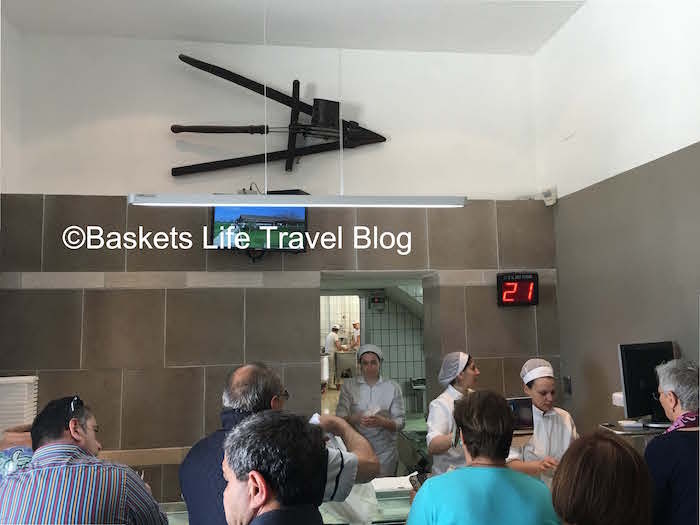 I am reminded of my brief visit I made to one of the cheese making centers in Lucerne, The smell that floated around their was too good and I am reminded of it now reading your post. You are so lucky to do that! I absolutely adore buffalo mozzarella. When I had it in Italy, I could not believe how much better it was than the mozz I grew up on in New York. I would definitely want to visit this place. Buffalo mozzarella is so delicious! The history of how we started using buffalo to make mozzarella is interesting! Thanks for the info! This looks like so much fun!! I always love learning how things are made, and mozzarella is so delicious. 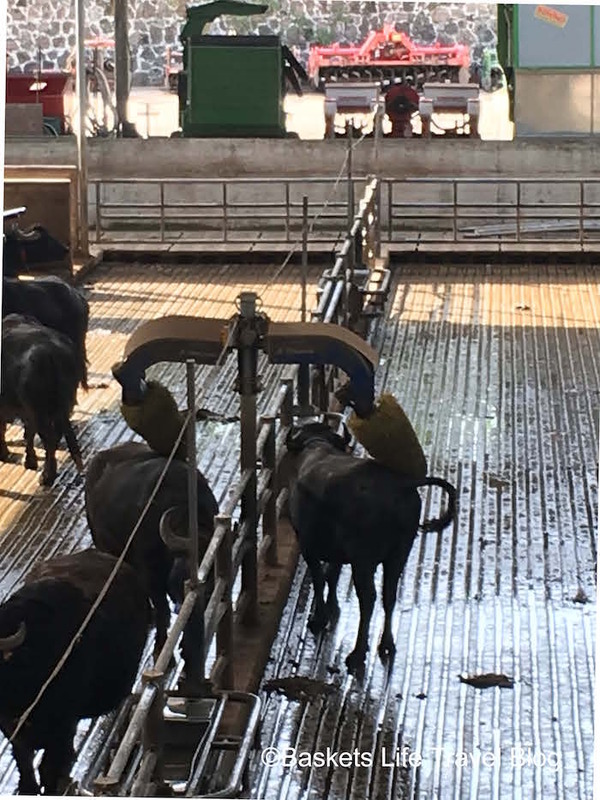 I love how they take such good care of the buffalo and have massage stations for them :) I will have to try and plan this into our next Italy trip! Mozzarella cheese on pizza is my favorite. Seems you had great time learning its manufacturing. Keep sharing. Oh, yeah! Buffalo mozzarella is divine. I'm surprised at how many people don't know that the source of the milk is the reason for its name. I was in this part of the world a few years ago on an Italian road trip and really wanted to visit a farm. Looks like I really missed out. I like activities based on food, especially a single food, especially something dear to the heart, and I think you really hit it here with this tour. I've never been to a cheese maker anywhere, and I think it would make a brilliant day. What a fun and informative day - and I love that it's all about cheese! White gold is an accurate description and it's great that you had a private tasting too! Thank you Vicki - yes the Tasting was the best part! YUM! The best mozzarella by far is mozzarella di bufala. What a great experience. I have never tried yoghurt or ice cream made from buffalo milk. I really want some now!! Thank you Sara it was an awesome day! We didn't know about the yogurt or ice until we visited either ~ It was amazing Best ice cream I have ever had! Sounds like a fun day out for the family and who knew it was made from water buffalo, now I know! Me too I had no idea - Oh that sounds like a fun night Pub Quiz Night! I have loved buffalo mozzarella ever since eating my first caprese here in California. Love hearing about the process and DOP. Now I know. Now I really need to get to Italy!! Oh Me too it is one of my favorite things in the world LOL! You should for sure come to Italy! Massage machines for the buffalos? Haven't they got the life. I don't know if I have ever had buffalo mozzarella (I have eaten a lot of pizza in various countries :) ) but I want to try it. Hi Rhonda thank you for reading - They really do have a wonderful life. They are treated so well it was nice to see. Probably not in most countries they don't use it and even it Italy you have to ask especially for Mozzarella di Bufula if you want it on on pizza and only some places do it. :) For sure you should try it! I remember the last time I was visiting friends in the south of Italy and had a lunch where buffalo mozzarella was the star of the menu. I didn't like it beforehand simply because I never had the chance to have it handmade and freshbbut since that day I'm in love with it! HI Camila thank you for reading! Yes so true if you have never had the real thing it is a whole new experience ! We are in love with it too! If I happen to be in Italy? No, no my friend, I will make a special trip for this. I'm adding it to my summer schedule now. Thanks for linking up with #wkendtravelinspiration! Well Awesome look us up and let us know if we can give you any tips on Italy. After living in Italy for a year we have a really good insight to the country! Thank you for reading ! Ummm... must go here. I had no idea about any of this process and you made the cheese sounds sooo delicious. I am really sad I'm so far from Italy now! Looks like time well spent. Even the little one seems to have enjoyed it! I really want to try the vanilla ice cream! I must confess I'm addicted to vanilla and that one has got to be amazing. Now I really have to go to Italy! One more reason to visit this beautiful country. Thank you, Stacey! I love it too - you will find it in Northern Italy as well - Not the farms but you will find the mozzarella de bufula and can order in restaurants and buy in the stores - so no worries ! I love mozzarella on my pizza and salad, with a visit to the cheese farm makes it more authentic experience eating it from the main source. I would love to visit that place too. An absolute great experience ! It was great to see and find out why Buffalo mozzarella tastes so good and how it's made. 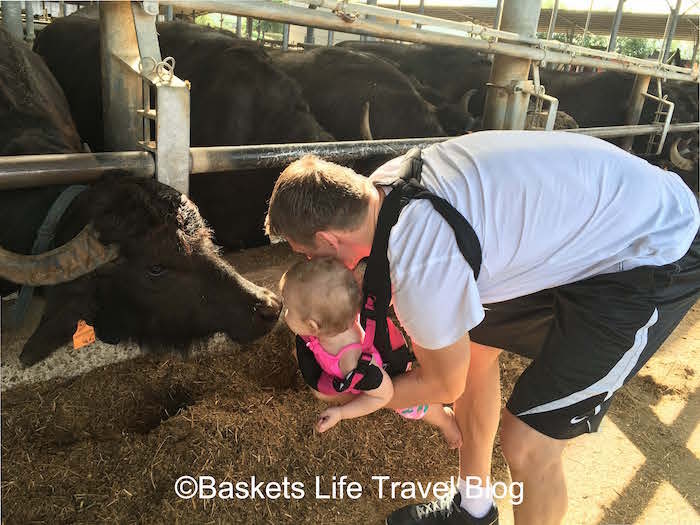 Tasting cheese and ice cream and petting buffalos were awesome ! This would be right up my alley!! I love all cheeses, but mozzarella is definitely my favorite. Will definitely have to check this out next time I'm in Italy! Me to if it involves food I am in!! If you want to see this farm - which rocks click on the link to their site and just shoot the an email.